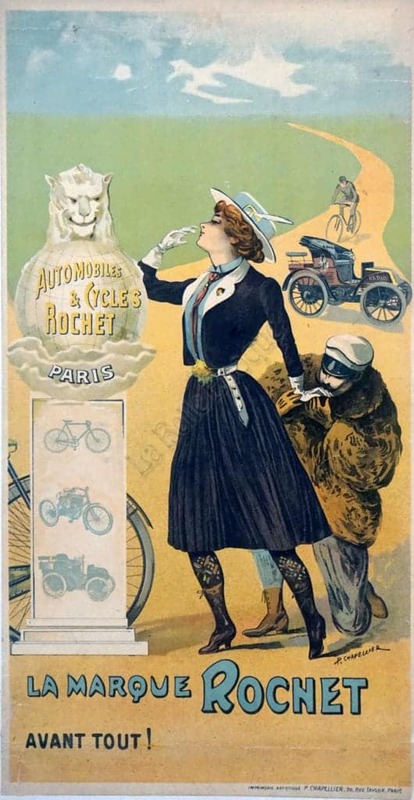 This is a French Art Nouveau period advertising poster for Rochet automobiles and bicycles, created by P. Chapellier at the end of the 19th century. This wonderful poster features a pleasingly subtle color palette of blue, green, yellow, and browns. In the center foreground of the poster, there is a smartly dressed woman wearing a black skirt and matching jacket, accented with a white hat, gloves, and belt. Behind her is a man dressed for driving kneeling down and kissing her hand. A winding road stretches out into the background behind them with a bicyclist riding in the distance. A beautifully detailed car idles directly behind the couple, completing a fabulous main image that plays on geometric perspectives and subtle curves to entice the eye of the viewer. The blue, yellow, and white typography perfectly completes this French bicycle and automobile advertising poster. Printed by imprimerie artistique p. chapellier, 20 Rue Taylor, Paris, 1890s.